Digital Art : Futuristic artworks was created by Charis Tsevis who is a visual artist currently living and working in Pafos, Cyprus. The artworks are all abstract creations with a colorful background. 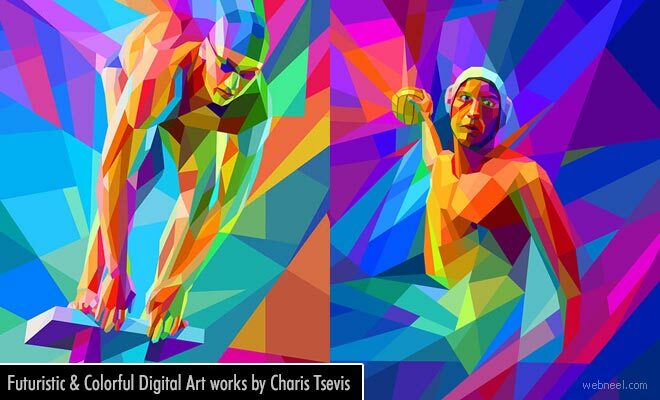 The Olympics apartments in Moscow are split into various categories according to the type of game lie swimming, soccer, tennis, basket, volley and many others, Charis Tsevis is the mastermind behind these large murals and you can see them scattered across the olympic apartment arena. According to his biography, "Charis is a visiting professor of Editorial Design and Typography at the AKTO College in Athens since the year 1996. He holds a Diploma in Graphic Design from the Akademie for das Grafische Gewerbe, Munchen and a Master in Visual Design from the Scuola Politecnica di Design, Milano. Charis is often writing articles about design theory, aesthetics and history of computing in some highly respected art and IT magazines in Greece (+design, RAM etc). He has also written 2 books about Adobe Photoshop. His client list includes companies like Nike, Google, Ferrari, PepsiCo, Toyota and IKEA, advertising agencies like TBWA\Chiat\Day, Saatchi & Saatchi LA, DDB Munich and Leo Burnett Hong Kong and media like Time, Fortune, Wired and the Wall Street Journal".